TIRE SWING TRAVELS: Oh What a Night! What a wind storm we had during the night. The wind began to intensify around 2am. By 4am the wind was howling and the motorhome was rocking and shuddering and we couldn't sleep. We could hear the desert sand swirling around outside, at times it sounded like rain as it slapped the windows. The awning over the slide sounded like a sail slapping in a gale. After pulling the slide in and lowering the tv antennae, we lay in bed and listened to the wind, finally getting back to sleep as light was appearing on the horizon. Later we learned that the winds may have been as high as 60 mph. Mollie stayed curled up on the bed throughout the night and seemed unfazed by the commotion. We were up again before 7:30, turned on the generator and decided we would have a quick breakfast and then pack up and leave. After 3 nights without hookups and limited generator use, we were ready to go south and to a lower elevation. 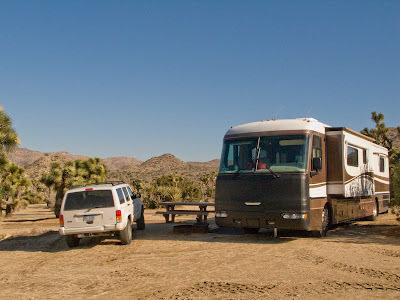 We had a nice time at Joshua Tree, hiking and exploring, however the campground was a bit of a disappointment. First of all, it's 5 miles from the park entrance and secondly doesn't appear to be very well taken care of. And we both felt that the $15. per night charge for the priviledge of dry-camping (with lots of rules and very limited generator time ) was a bit steep. We drove about an hour down to the town of Indio where we had full hook-ups!! Although it was still quite windy, the sun was shining and the air was warm and pleasant. Judy did some laundry and vacuumed away the dust, and John got to watch the Super Bowl while we ate chicken tacos and homemade guacamole/mango salsa. You were in Indio?? Great town. Should have told me. I'd direct you toward the Food 4 Less - there's a fantastic 4/$20 t-shirt stop next door.